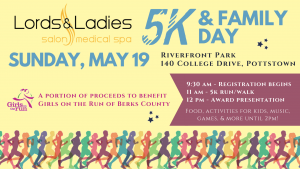 Lords & Ladies 5K & Family Day! Come Join us for our second annual 5k Race & Family Day!!! Registration Fee: $25, Kids 13 and under run FREE! Enjoy food trucks, kids activities, music and games until 2pm! Bring the entire family! A portion of the proceeds to benefit Girls on the Run of Berks county!